Manchester started to grow rapidly in the late 18th century with the onset of the industrial revolution. The population grew from around 10,000 in 1753 to over 60,000 by 1800 with which came increasing amounts of waste to be dealt with. 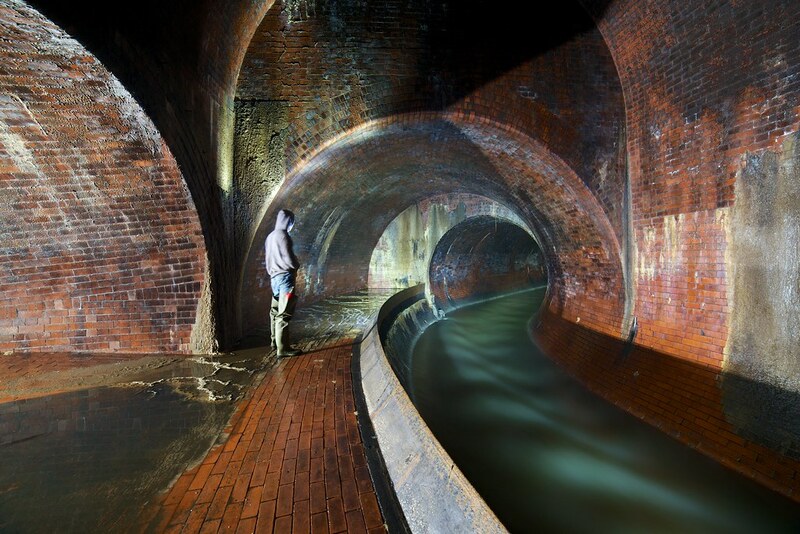 The earliest sewers in Manchester were likely to be culverted watercourses such as the Hanging Ditch and River Tib. The first proper sewers were constructed when the 1792 Police Act gave powers to (amongst other things) pave and sewer the streets. Records of the early sewers is scant with many being lost or degrading beyond repair in poorly maintained storage archives. There are 2-3 miles of early sewers under the oldest parts of the city, the courses and locations of many are not well known. Some have been incorporated into other systems or replaced but uncharted sewers turn up occasionally such as in 1979 when one was found under Oxford Road while doing work nearby. Another Police Act in 1828 led to the foundation of the Paving and Soughing Committee which had funds for constructing sewers. 1830 saw sewering of the outskirts of the city and then from 1835 to 1860 the surrounding towns such as Cheetham, Ardwick, Chorlton and Hulme. Sewers were generally laid under streets and flowed to watercourses such as the Irwell, Irk and Medlock. They were frequently U shaped and no bigger than 3ft with barely any manholes for access. Between 1840 and 1850 around 25km of sewers were laid within a kilometre of the Town Hall. This rapid growth sometimes led to poor quality construction which made it's presence felt years later with sewer collapses in the city centre. 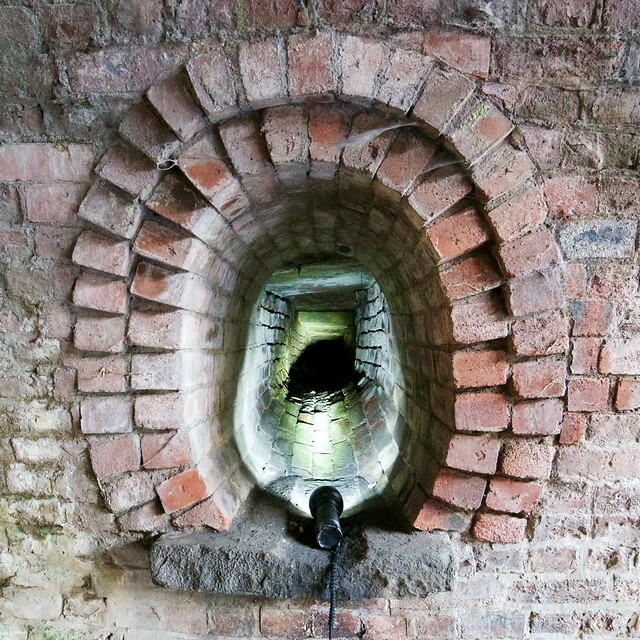 The sewers were mostly brick although John Francis, the City Surveyor in 1848, introduced self cleansing, egg shaped clay pipes which were cheaper and quickier to install. They found widespread use until 1880; it was later found that the puddle clay to seal each section tended to wash away. This meant the sewerage leaked out, ground water leaked in and eventually the ground above collapsed into the voids formed around the pipe. 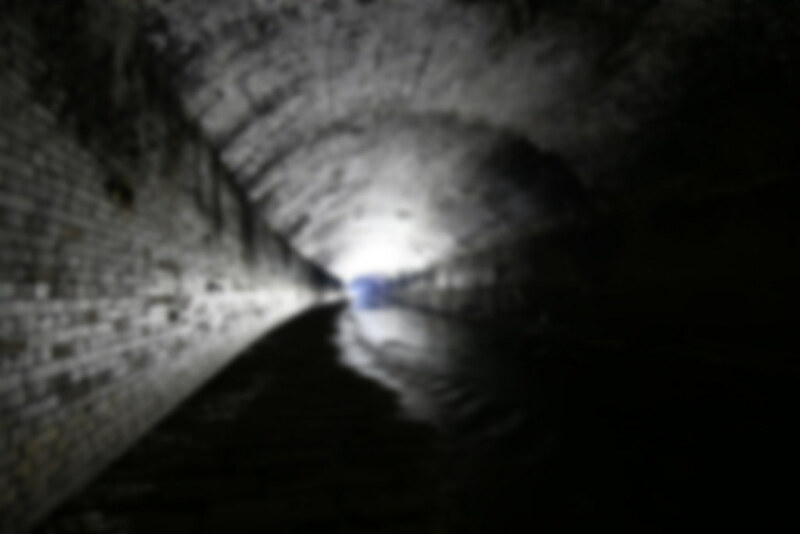 Sewers were originally intended to deal with surface water from rainfall. 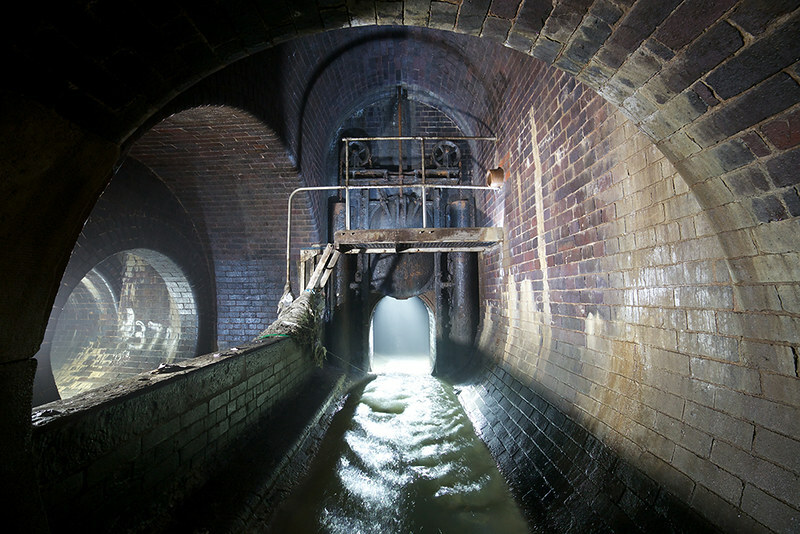 As Manchester grew throughout the 19th century the expanding use of water closets, overflowing cess pools and industrial waste rendered the receiving rivers little more then open sewers themselves. The rivers were instrumental in shaping the course of the sewerage system, it was in attempts to control flooding and pollution that committees were formed and schemes put forward that would shape the main drainage system we have today. Over the years many plans were put forward to address the flooding issues; solutions ranged from unblocking slow moving channels, installing large tunnels and adjusting weirs. The Irwell and Medlock have been prone to flooding in the past. 1866 was known as the 'Year of the Great Flood', rain fell for 3 days straight and the Irwell rose 14ft above normal levels in places flooding 1,100 acres of land. J F Bateman proposed a flood relief tunnel for the Irwell in 1868. It was to start at Salford Cresent, then cut through Salford to outfall near Regent Road Bridge. Too many problems were presented by this idea and it was ultimately dismissed. The Medlock followed a winding course through the city and on it's banks landowners had built jetties and obstructions, all this hampered the free passage of water during storms. The Medlock Improvement Committee was created by the Council in April 1863 to address the flooding issues. The Manchester Improvement Act of 1865 allowed the Council to improve matters, however in the following years there were still several severe floods. In July 1872 the River Medlock burst it's banks and washed away corpses from Bradford Cemetery. The Council spent £15,000 to pave the bed of the River Medlock through Philips Park which helped protect the cemetery. To this day it flows through an open culvert of terra-cotta brick although recent efforts have been made to start returning the river around the park to a more natural state. The City Surveyor at the time, Mr J G Lynde proposed a scheme to the Medlock Improvement Committee in September 1874 for a 20ft tunnel. 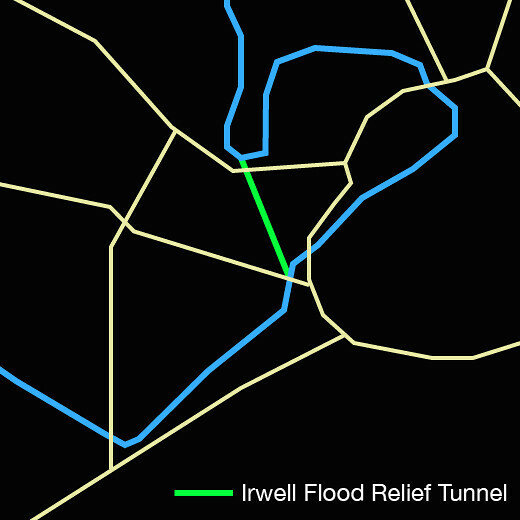 This would intercept flood waters at Pin Mill Weir then cut through the South side of the City to the Irwell below Throstle Nest Weir. It was also intended for use as an outfall sewer and initially costed at £200,000. A month later the price increased by £70,000 as the dimensions increased to 34x24ft. The scheme was presented to the Council on the 9th of December, it was said that if a such a large tunnel was to be built then it should intercept all the sewers that were polluting the rivers as well as carrying Medlock stormwater. The Medlock Improvement Committee asked Bateman and Lynde to return with a matured scheme which catered for the increased scope. This came back a couple of years later in November 1876 as a joint report by Messrs. Bateman and Lydne. There were 3 different proposals for controlling flood water; straightening the course of the Medlock, a large flood relief tunnel similar to the previously proposed and finally the building of a reservoir above Medlock Vale which could act as a buffer during storms. The tunnel solution was favoured above the others, it would be 20ft in diameter, convey 4,000 cubic feet per second and was estimated to cost £200,000. The second part of the report detailed a system of intercepting sewers. The Surveyor, Mr Allison, reported to the Rivers Committee in March 1881 that an inspection of the Irwell and Medlock had been made. He found that flooding could be reduced by dredging, installing better flow management such as sluices and channels, and finally by removing groins and jetties. This was put before the Council who later approved the plan and in 1882 "The Manchester Corporation Act" was obtained which enabled the work to be done. An inspection in Feburary 1884 showed that there had been big improvements to the Medlock and Irk from improvements to the river bed, altering weirs and installing retaining walls. In Feburary 1886 the City Surveyor reported that altering Throstle Nest Weir on the River Irwell, had a large effect on lowering flood water through the city. The Medlock ultimately flows into the Irwell, before this though is an interesting setup where water could be sent into the Bridgewater Canal via sluices at Knott Mill. The remaining water dropped down into Castlefield Basin Culvert, a tunnel cut through the sandstone underneath the canals. Two men were employed to regulate the sluices 24/7, this along with an opening known as Giant's Swallow (which took excess water from the canal back to the Medlock) alleviated flooding for the upper section of the Bridgewater canal. The city had an area of 4,294 acres with over 100 districts, each having a sewer flowing directly into a local watercourse. The Messrs. Bateman and Lydne report proposed 21 main intercepting sewers that would mainly follow the line of the rivers and divert all the sewers into a main outfall sewer. They were given the letters A through V (the 'I' Interceptor was deemed unnecessary during further planning and not built). 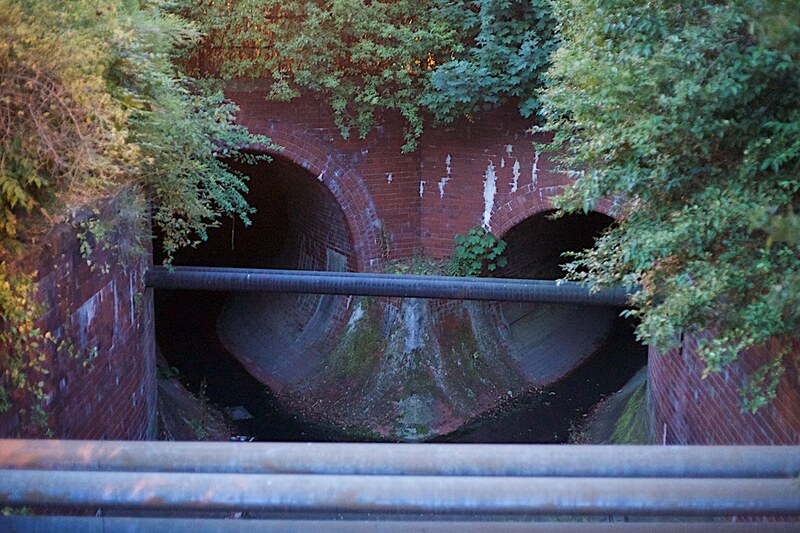 The Outfall sewer took the flows to Davyhulme where a sewerage works was to be built. The existing river outfalls were to be largely retained as stormwater overflows. The total cost of building the sewers was estimated at £320,000 and the treatment works £100,000. 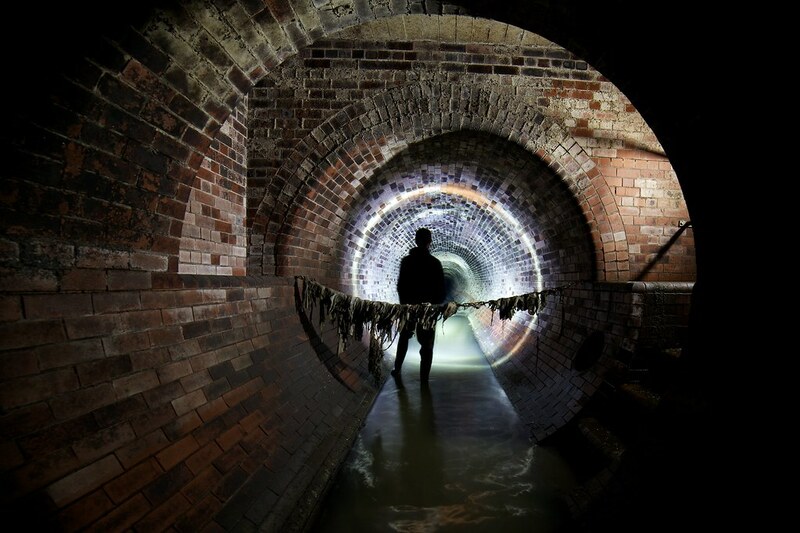 Work began in April 1889, took 10 years and ended up costing around £700,000 to complete the 56km worth of sewers. A report in July 1877 suggested a larger combined drainage scheme with the surrounding townships would be more effective. The Council agreed and upgraded the Medlock Improvement Committee into the Rivers Committee. This gave the powers necessary to speak to other local authorities, 15 of them came to a conference at the Town Hall in 1878 and some showed an interest. Mr John Alison took over duties as City Surveyor and submitted a report on the sewerage rate of the different districts, the city generated by far the largest amount of sewerage with 3,329,000 cubic ft/day. The joint scheme was abandoned in October 1879 as it was impractical to work through details with the other authorities who were concerned with the cost of the joint venture. In April 1880 Mr Alison wrote to other towns for guidance on sewerage treatment and visited some including Bradford, Leeds and Nottingham. His findings were reported to the Council in February 1885 and the Rivers Committee started to look for land that could be used for the sewerage works. On 17th May 1886 the City Surveyor presented his plans for the proposed Main Drainage Scheme. It roughly followed the previous plan by Messrs. Bateman and Lynde but abandoned the flood prevention tunnel and added in the districts of Bradford, Harpurhey and Rusholme. This had a total drainage area of 5,934 acres at a cost of £412,081. Several civil engineers were invited to advise on both the construction and cost of the scheme. Mr John Bailey Denton was taken on and he proposed several improvements in 1887. Suggestions such as provisions for a larger population and higher rainfall were deprioritised in favour of removing a pumping station at Hunt's Bank to allow for a fully gravity based system. The engineer recommended an iron box to carry the G Interceptor across the River Irk just before it met with the Irwell. Also suggested were self acting flaps on overflow outfalls to prevent river water entering the sewer in flood and modifications to the land at Davyhulme. The Rivers Committee presented the modified scheme to the Council in April 1887 at an estimated cost of £500,000, it was approved and a public inquiry was held in September 1888. Stretford was incorporated in the scheme by agreement in December 1888. The sewage of 1636 acres of the district's land would be taken and the Stretford local authority would contribute to the cost of constructing the sewers and pay a yearly fee for treatment. The scheme was approved by the local government board in March 1889 and the Rivers Committee was instructed to carry out the work a month later. The outfall sewer (Nowadays called Outfall A) was built in two main parts. The lower section commenced at Davyhulme and was a circular 10ft brick pipe built with three rings of brick, the invert being made of blue brick and the upper half red brick. The upper section started just under 4km from Davyhulme, this was an ovoid design 14ft tall and 10ft wide. The ovoid shape was chosen in order to avoid pumping and allow it to pass under three railways and a number of other sewers. The Manchester Ship Canal (MSC) had not been built when the scheme was designed, Throstle Nest Weir was the closest place to the city where water levels allowed a storm overflow to be built. When the MSC was constructed in 1894 the weir was removed and the next closest place became the Mode Wheel Locks. There was a 13ft fall on the downstream side of the locks which was enough to build the storm overflow where today the outfall lies underwater. Many old defective sewers needed reconstructing before connecting to the interceptor system. Though not a primary part of the Main Drainage Scheme the cost of rebuilding them was included as the Surveyor thought it to be necessary. A overflow chamber was built to send flows down a 9ft overflow culvert to the Mode Wheel outfall, nowadays the overflow is nicknamed Lock Stock. This 51ft x 27ft chamber marks the termination of the circular sewer and start of the larger ovoid sewer. It's discharges were subject to a clause within the February 1890 agreement with the Manchester Ship Canal Company. This basically said the overflow would only spill when the volume in the outfall sewer was 6 times the normal level which equates to flow more than 6ft 4in deep. Slots were designed into the overflow weir into which baffle boards could be dropped should spills be found to be damaging the ship canal, thus increasing the spill threshold to 8½ times the normal level flow. Where the Outfall Sewer crossed the Bridgewater Canal a 10ft cast iron tube made from bolted segments was used as there was not enough room for the normal brick pipe to pass underneath. Downstream the sewer crossed the canal again and there was even less depth available, so two 8ft 9 inch cast iron pipes were used instead of one bigger one. In 1890 the city extended it's boundaries, the Main Drainage Scheme was one of the key reasons the local authorities agreed to being incorporated into Manchester. The areas included Blackley, Clayton, Crumpsall, Kirkmanshulme (part of Longsight), Moston, Newton Heath, Openshaw and West Gorton. This required an extension of the sewers to reach these areas, the sizes had already been decided upon and the City Surveyor, Mr Allison, was under the impression the system could cope even with the increased load. The plans were drawn up and were ready June 1893. The extended plans for incorporating the out townships received Council sanction in October 1893. An inquiry was held by a local government board inspector and the borrowing of an additional £100,000 was granted May 1894 for extensions to the B, J, M and U sewers, the Council had finally got it's joint scheme. The City Surveyor Mr Allison died in February 1894. Thomas de Courcy Meade was appointed as the new Surveyor in July 1894. He requested an extra £100,000 to complete works, buy a sludge streamer and also additional machinery at Davyhulme. The Council approved but stated they needed a full report before borrowing any more than £50,000 in the future; the work by this point was estimated to have costed £700,000. New filter beds at Davyhulme were found to be defective by Mr Meade so he recommended a full check of current sewer work. Charles Jackson performed this duty in November 1894 and he found some sewers had such bad workmanship that whole sections needed replacing. Others had been constructed from less costly material then specified such as Stackstead red brick instead of Staffordshire blue brick and some which should have had stone inverts only had brick ones. To add insult to injury, an audit revealed extra payments were requested for work not actually done, some by over a thousand pounds. In August 1895 the Surveyor again found a large amount of work had been done badly during a systematic inspection of work. The brickwork needed to be cut into to check it, often the sewers were small and inspecting it all was a long and painstaking job. The contractors started to replace the bad work as it was found. In places the void outside the sewer was not being filled with bricks and mortar to prevent the subsidence of the ground above. After a period of heavy rainfall in July 1895 the sluices in the storm overflow chamber at Davyhulme had to be lifted to prevent the boiler house from flooding. A tree trunk had found it's way down the outfall sewer and caught on an iron grid along with grass and the usual rags and detritus which clogged it up. This was unusual and when the Surveyor looked into it he found that overflow outfalls on the Medlock, Irwell and the sewer bridge at Hunts Bank were submerged in the storm and acting as inlets from the rivers to the sewers. It was thought when the interceptor scheme was designed that the river flooding problem would have been sorted out by the time it was completed, which was not the case. That along with unreliable outfall flaps as suggested by John Denton contributed to the influx of water. 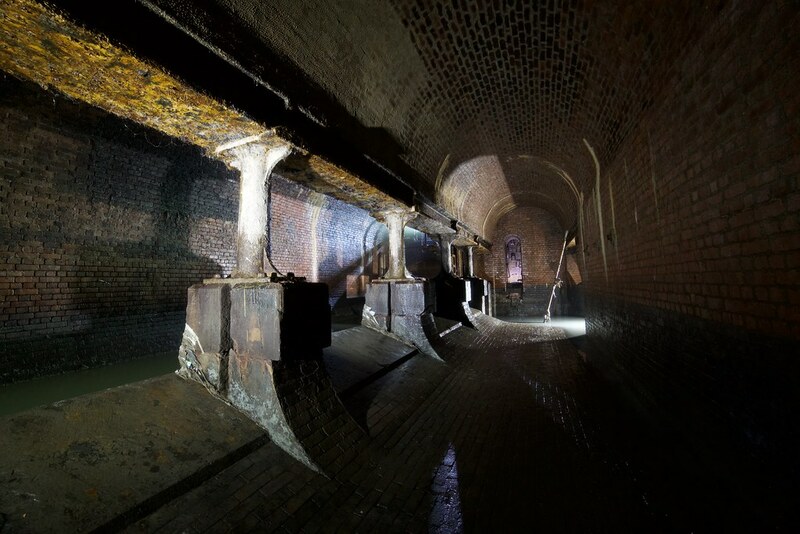 The overflows under construction in 1896 were fitted with penstocks that could be adjusted by hand to ensure dilution of sewerage to the river but keep most the stormwater out of the sewers. 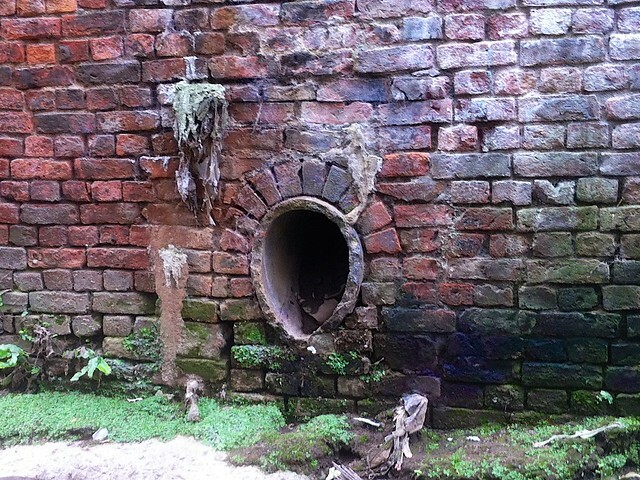 The sewers only started to be built with ventilation after 1889, manholes were built at changes of line and gradient. The main interceptors were first to be ventilated, followed by smaller ones in 1894 built by the Paving committee. Older sewers were a troublesome issue as often they were not cleansed well so installing ventilation without sorting the deposits that had built up would constantly vent bad smells into the streets. In May 1901 there were a couple of sewer explosions in Miles Platting; a number of lids were blown off along the line of the Shooter's Brook relief sewer as well as the O and P sewers which flowed into it. An investigation by a city chemist revealed chemicals had leaked from the works of Messrs. Hardman and Holden and the Manchester Oxide Company, although representatives from each company claimed nothing unusual had entered the sewers. The Main Drainage Scheme was originally designed in 1886 to serve 5,934 acres, this expanded to 12,911 acres in 1894 and 23,420 acres in 1909 with a 90% increase in population in that time to 715,335 people. The sewers were originally designed to deal with 868,522 people, the total sewerage and stormwater flow turned out to be over double the maximum capacity of the system. John Denton was responsible for advising on the sizes of the existing outfall and intercepting sewers in 1887. At the time he determined the sewers should be able to cope with double the population. Unfortunately the data he had on sewerage and rainfall per head was not reliable and his predictions were too low. He did advise on bigger pipes to cater for a larger population but the Council decided to act on other suggestions instead. The small sewers and growing population meant the sewers were often overwhelmed and flooding occurred often. A report in September 1909 showed stormwater reaching critical levels across the entire interceptor network earlier that year. Mr Meade submitted a report in 1910 where he recommended the building of 16 new sewers, these formed the basis of what went onto become the Work Series interceptors. The services of Sir Alexander Binnie were employed by the Rivers Committee to do an independent investigation into the enlargement of the main drainage system based on the plans of Mr Meade. Sir Alexander had previously designed major parts of London's Main Drainage System. It was estimated that the population would reach 1,100,000 by 1959. Sir Alexander anticipated the increasing load on the system would not stop once all the land within the city boundary had been built on. The new proposed scheme was laid out with provision for other districts becoming included at a later date, up to a total of 1,400,000 people. The original interceptor system had insufficient capacity due to a lack of knowledge on how much stormwater the system would need to deal with. Both Sir Alexander and the City Surveyor independently calculated how big the pipes of the new system would need to be in order to accommodate current and future flows. The Work Series sewers were built at a higher quality; apart from the years of accumulated filth the brickwork in some of the massive overflow chambers looks brand new. Stage one of the works was completed in 1934 with the price rising from the £50,000 estimate by £6000. The final cost ended up at £1.6million when the Work 6 Interceptor through Openshaw was completed in 1973. The Work 5 interceptor was laid out as the main North/South sewer through the city, it started in Blackley to relieve the sewer there that was liable to surcharging. Sir Alexander proposed the sewer be constructed in a tunnel through the sandstone at quite a depth beneath a major road as the rock was easy to tunnel through and would not interfere with traffic as much as a cut and cover method. An alternative route was suggested along the bottom of the Irk Valley but was deemed too expensive. An overflow chamber was built to relieve the sewer of stormwater before it reached the city. Today this is nicknamed SSSI and spills into the River Irk. The Work 5 changes into the Work 4 Interceptor and later Outfall B as it leaves the city. Various connection points were made between the two outfall sewers to help balance the load or allow a section to be closed off for maintenance. Examples of these have been nicknamed: Packin' Heat, A2B and Packin' More Heat. The existing sewers around the Fallowfield/Rusholme neighbourhood (Q,R,S & T) were so undersized that the storm overflows were unable to relieve them in times of heavy rain, the levels were known to rise 16ft above the sewer invert. The 2m+ Work 10 sewer was built to intercept these and continue through Moss Side to join the Work 4 just upstream of a new overflow. This was called the Work 9 overflow and later nicknamed the Hulme Flume. It could be built due to the levels of the incoming sewers being slightly higher than the River Irwell. Sir Alexander mentions the existing outfall sewer (Outfall A) "would be totally incapable of dealing with any additional drainage" from any of the proposed sewers and the rest of the scheme would be useless without the critical overflow point. It was proposed that construction should go ahead without waiting for the Parliamentary sanction needed to fund the rest of the scheme. This overflow would relieve the A and B Outfall sewers as well as the B Interceptor. The 2.8m Work8 sewer was constructed to help drain Didsbury and intercept the sewer that drains the Southern part of Mosside not drained by the Work 10. This area was difficult to drain as the relatively flat land by the Mersey made building overflows impractical. This meant an oversize sewer had to be built instead at considerable cost. The Work 11 Sewer was constructed to intercept the flows at Gorton Sewerage works to try and help clean up the Gore Brook into which the Works discharged. Work 13 and 14 were to relieve the Irk Valley (B) and Moston Brook (J) sewers into the Work 5 Interceptor. 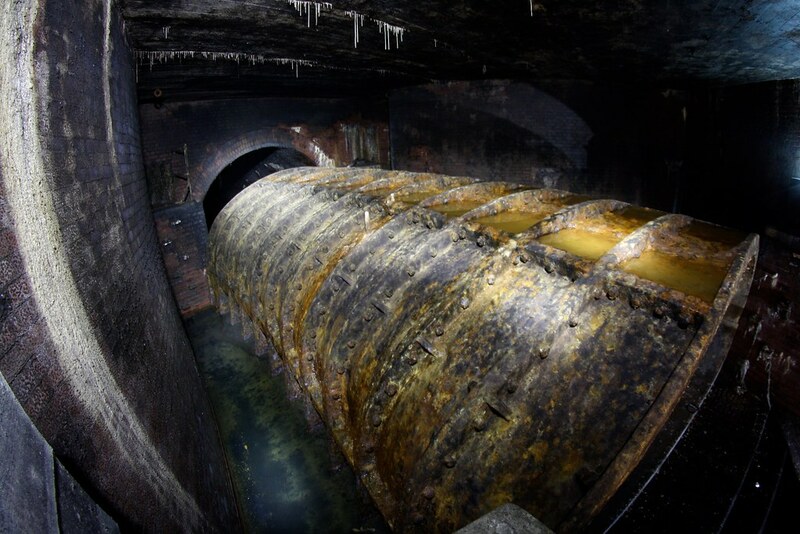 T de Courcy Meade's original plan included provision for a supplemental storm overflow sewer alongside the Mode Wheel overflow (Lock Stock), however it was thought that if the Work 9 overflow (Hulme Flume) was built then the additional sewer would not be required. The ground conditions for the proposed scheme were estimated though a series of boreholes and it was found that most of the work in the northern part of the city would be through rock. This was considered fortunate as tunnelling could minimise the inconvenience to traffic. The majority of the ground the main interceptor went through after the Work 9 Overflow was comprised of soft materials like clay sand and gravel. Much of this work was proposed as cut and cover apart from a short stretch underneath the Westinghouse Works which was tunnelled under. Sir Alex's estimate of work was slightly more than T de Courcy Meade's £842,300, he also added a 15% contingency which brought the total cost to bring before parliament to £970,000. In 1914 work was underway in building Outfall B when the outbreak of war meant the government refused permission to complete the work. It came to a halt in Trafford Park at a large crossover junction chamber between the old and newer outfall sewers. Work was resumed in July 1919 and completed two years later. City Engineer Mr J B L Meek directed the construction which was done by Messrs. Edmund Nuttall and Co. This section of work involved building several major components. The 98ft x 32ft crossover chamber itself had a semi circular arched ceiling which was comprised of 6 rings of brickwork. The new sewer leaving this (Lower Outfall B) was a circular 15ft tall tunnel four rings of brick thick, capable of discharging 330,000 gallons per minute. 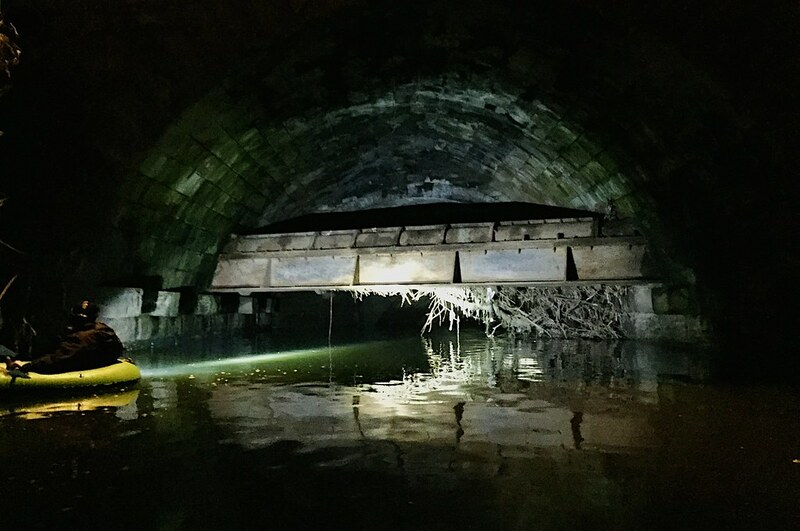 It later travelled underneath the Bridgewater Canal where it split into two box culverts, each with a semi circular invert and sloping benching. When checked recently the sides were completely underwater, see Duck. The sewer then came to the 9ft Mode Wheel culvert, a new overflow chamber was added which incorporated a 50ton cast iron carrier on hydraulic rams. This acted as an adjustable weir to permit stormwater to enter the existing overflow culvert. No tunnelling was required for the work, open cut techniques were used with steam cranes and a temporary railway alongside used to lift and remove excess material. A stretch between the canal and overflow chamber was not suitable for crane and train access so a runway was attached to the underside of cross members going across the trench. An electric powered 1 ½ton transporter lifted material away. In 1979 the City Engineer and Surveyor Geoffrey F Read said the condition of the interceptor sewers was reasonable but a large scale programme was necessary to prevent immense problems. At the time, the interceptors were 60-90 years old. A number of collapses affected some of the smaller sewers, poor construction and increased road loading could be partially blamed. Between 1975 and 1979 there were 45 collapses in the city centre. Most of these could be partially attributed to burst water mains flowing into the sewer which washed away the ground forming a cavity around the pipe into which the road above fell into. One of the largest collapses was at Slone Street, the 3.6m Work 5 Interceptor collapsed producing a cavity the size of 4 double decker buses. This was likely due to wear on a drop shaft connection from an earlier 1.5m sewer. Changing land use lead to some sewers becoming overloaded, the original J sewer was brick lined and overflowed constantly. During 1979 a 1.5m bolted concrete segment lining was installed in the old pipe which was then inner lined with concrete for a smooth finish, this stopped the sewer overflowing in normal conditions. The Manchester Corporation was taken over by North West Water following the Water Act 1973. This became North West Water plc in 1989 and then merged with the electricity board Norweb in 1995 to become United Utilities. Through a series of Annual Maintenance Programs (AMPs) United Utilities have invested millions in upgrading the system. The main interceptor system is still in use and seems to be coping with current normal level flows. Storm flows are a big issue however and over the years a number of Unsatisfactory Intermittent Discharges (UIDs) have been identified and sorted out. Generally these are overflows which are not screened to a fine enough level (if at all) and/or spill too often. Three main overflows have recently had major work done. The Mode Wheel overflow has seen the largest amount work, a series of 3 detention tanks linked by a new 3.6m sewer is designed to store 17,800 cubic metres of stormwater. The Hulme Flume and SSSI have had large screening chambers installed to filter out solids before they flow into the Rivers. 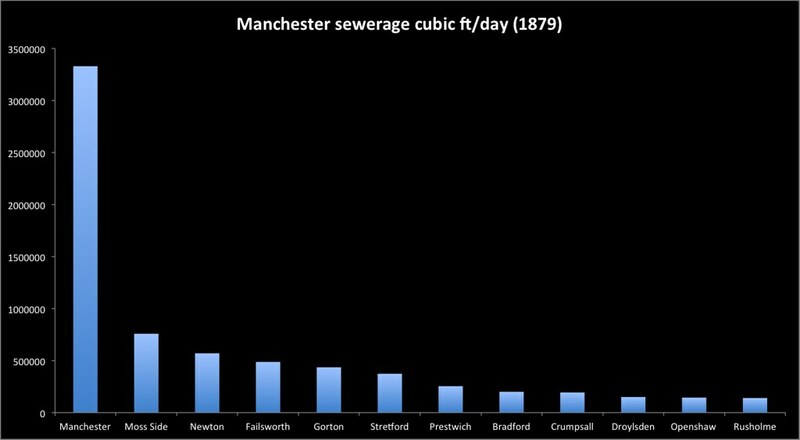 The amount of sewerage Manchester is producing is still increasing, for now the upgrades to the Victorian system should mean it is not overwhelmed. The rivers are cleaner than they have been in the past, fish levels are increasing and the River Irwell is now used for recreational activities. To maintain low levels of pollution further, large scale investment and construction will be needed.